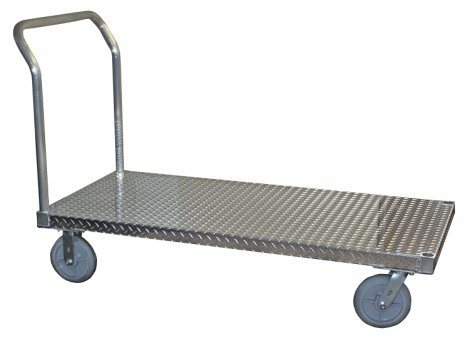 The Tread Plate Platform Cart cuts down on the work involved with transporting the heaviest warehouse loads and offers maneuverability even at a high load capacity. Tread plate adds friction to the platform surface to help keep your cargo in position. Side rails provide added strength and resistance against platform twisting and curling. Heavy duty understructure enables a capacity of 2,000 pounds to handle especially heavy loads. Side rails allow easy attachment of a protective bumper or platform carpeting. Two rigid casters add stability, while two swivel casters bring maneuverability. Load platform available in various sizes to accommodate the typical loads in your workplace. Place your order today for a heavy duty cart with a treaded surface to keep your cargo in place.